Aficionados of golf know almost immediately when they see the 18th green at the Westin Mission Hills Resort. As you are walking to the golf shop, a look to the left and you see water everywhere, a fountain spraying the liquid upwards, a beautiful green seemingly held together by countless railroad ties, framed mounding and punishing bunkers. This is Pete Dye's handiwork. Whether you call it the Westin Mission Hills Resort Dye Course or the South Course, this 6,706-yard par-70 design, which opened in 1987, can test anyone. It's milder Dye, but with target shots in abundance you have to pay attention. If you pass the test on your drive, Dye will certainly challenge you near the greens. And this Dye gem might not be the best golf course you can play at the Westin Mission Hills Resort. The Gary Player-designed North Course, which opened in 1991, is even more enjoyable. PGA West still gets most of the praise for championship golf in the Palm Springs area, but if you play the courses of the Westin Mission Hills Resort you get a double punch of challenging golf from two of golf's most recognized names. "The Dye Course is very playable," said head professional Randy Duncan. "Dye has a history of having challenging layouts and this one is in excellent condition. I can't imagine a course with any better greens. I think a lot of people really like the Player Course because it sits out by itself, there are no homes around it for now, there's lots of wildlife and it's very peaceful." The Dye Course greens are Tiff-Dwarf Bermuda and they are perfect. The Player greens are Penncross Bentgrass, and even though they roll great, they are being attacked by poa annua. The poa annua is winning the battle. 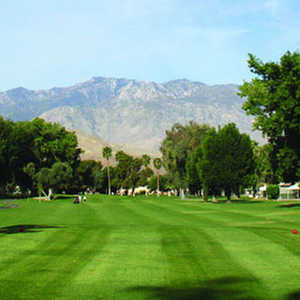 Player integrated the Mission Hills North course to fit with the natural desert surroundings. Whenever possible he incorporated the greens and tees into the existing landscape. But it also sports beautiful waterscapes and waterfalls with a backdrop of the serrated peaks of the San Jacinto Mountains. The generous fairways may give you a sense of security along with the fact there are no blind shots and few doglegs. Elaborate rock formations are set in the waterscapes, but most likely the water won't be a factor on most holes. The challenge is the length of the course and the seasonal winds that are known to whip around. You really get the feeling of being in the country on this course. If you are first off the tee you will be chasing off the countless jackrabbits who are playing in the early-morning dew. And you might just play a 3-hour round if you have fast playing companions. Starting with No. 8 the golfer will have seven straight holes with water looming. No. 9 is the No. 1 handicap hole from the back. It's 447 yards and a par 4. There's water left on the drive and on the approach. The 10th is one of those short par-4 holes that will get you drooling from the tee. It's only 374 from the back. There's water on the right, not really in play. So just take enough club to hit it down the middle. No. 11 is the fourth toughest hole. This par 5, 558 yards has water all down the right and your approach has to fly water. Take advantage of this solitude now, however, because there are future plans for residential building and a hotel for the Player Course. The layout hosted the LPGA Tour Qualifying School, second stage for five years. 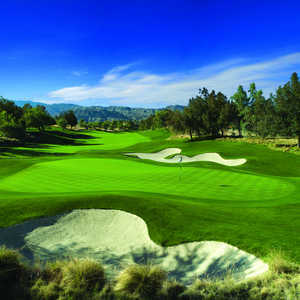 The 1992 and 1993 California State Open was played here along with the 1992 Senior PGA Tour National Qualifying Finals. The Dye Course has also hosted the California State Open, Senior PGA, LPGA, and Nike Tour Qualifying Schools and the Frank Sinatra Celebrity Golf Tournament in 1997 and 1998. Dye's first big challenge is the No. 1 handicap 7th hole. It is a 446-yard par-4 from the rear with a narrow green guarded by water on the left. The 8th is a par-3 beauty, 197 from the tips with a water carry. There's plenty of bailout area to the right, but if you over-cook it left it will be wet. The finishing hole is reward enough. It is 385 yards of water left and sand right. Your second shot could go over the green into water or go right in sand. But there is a small area in front to land safely. The Westin Hills Resort is home for countless waterways, 360 acres of waterfalls and floral gardens. With Moroccan architecture and more than 500 rooms you can also enjoy tennis, swimming, bicycling, health and fitness centers and shopping at Palm Springs. The rooms have either patio or a balcony from which you can enjoy the sunset overlooking the golf course. And just imagine a luxury resort where you can actually park your car within steps of your room. The Las Brisas pool was built to mimic the nearby Indian Canyons with a 60-foot, S-curve water slide that spills into a lagoon-style pool. Rancho Mirage has been known as a playground for the rich and famous. Driving to the resort you may be cruising on Bob Hope Drive...turning left to Dinah Shore Drive. Minutes away is Elvis' honeymoon hideaway. The Golfer's Choice Package includes double occupancy standard room accommodations with two rounds of golf. It is available to April 30 for $459 weekdays and $509 on the weekends. Replay Days provide golfers with unlimited golf for one day along with one-night standard accommodations, double occupancy. Replay Days are available May 1 to May 31 at $229 weekdays and $289 weekends. The Unlimited Golf Package has one-night standard room double occupancy and unlimited golf from 2 p.m. check-in to check-out the following day. These rates are from June 1 to June 30 at $135 weekdays and $164 weekends. From July 1 to September 11 the rates drop to $119 weekdays and $159 on the weekends. Directions to the Resort: From Palm Springs Airport and From Los Angeles, take I-105 east and merge into I-605 north. Proceed to I-10 east exit towards San Bernardino. Stay on I-10 for about 100 miles. Take Ramon Rd exit towards Bob Hope Dr. and turn left. follow Bob Hope Dr. to Dinah Shore Dr. and turn right. Directions to the Gary Player Course: Take I-10 south and turn right at Ramon Road. Course is one mile on the left. Awards: Golf Magazine included it in it's " Top 10 New Resorts. Golf Digest's 1996 " Silver Medal Resort" ranking. Courses."